1. 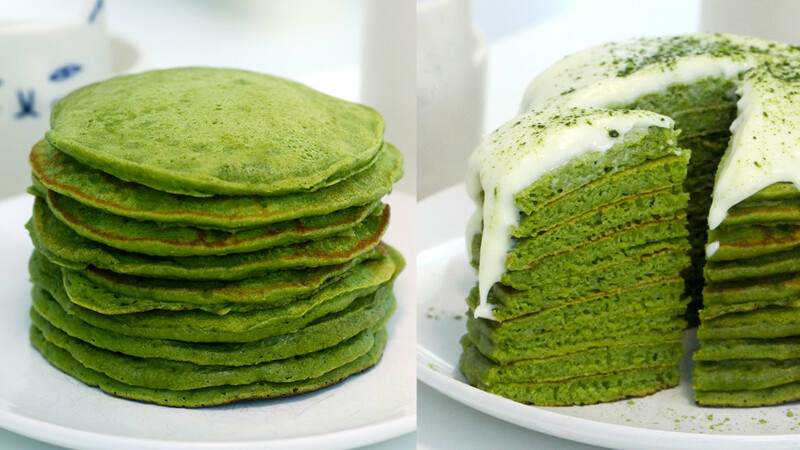 Combine the flour, matcha green tea powder, sugar, baking powder and salt in a bowl. In a larger bowl, combine the milk, butter and egg and whisk until fully combined. Add the dry ingredients and whisk together, but make sure not to overmix. Some lumps are fine! 2. Heat a frying pan over medium heat and spray with cooking spray. Dollop 2-3 tbsp of batter onto the frying pan and smooth the surface with the spoon. Cook until the surface of the pancakes develop some bubbles, about 1-2 minutes. Flip and cook for an additional 1-2 minutes, or until the surface has browned. Continue with the rest of the batter. 1. Beat the cream cheese with an electric mixer until smooth. Add the confectioner’s sugar and milk and mix until combined. 1. Stack the pancakes and pour the glaze on top. Top with strawberries and enjoy!